You are suffering from back pain and you want to know where the discomforts stem from, how to deal with them and what you can do about it? Each back pain is an individual case in itself and therefore has to be treated individually. This is why an accurate and thorough diagnosis before and during therapy is very important. Until recently, only radiographs have been considered for treatment. This was our reason to search for alternatives, so unnecessary radiation exposure to the body can be avoided. The 4D spinal column measurement is a contactless measuring method working purely photo-optically: a grid of lines is first projected onto the patient’s back, then recorded by a video camera. 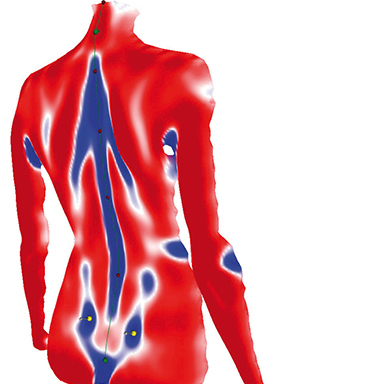 In the next step, a three-dimensional image of the back surface is generated by computer software that analyzes the line curvatures. Based on this “virtual plaster cast” of the back, the spine’s spatial development and the position of the pelvis can be recreated. The measurement takes only a few seconds, providing information on the entire body static and posture, e.g. the spinal curvature, vertebral body rotation, pelvic position and even muscular imbalances. The illustration on the basis of graphics is enabling the patient to be comprehensively informed about their initial situation, the simulation of compensation and therapeutic options. Leg axis measurement can be performed in addition to the 4D spinal column measurement, thus completing our 4D body statics measurement. The leg axis geometry is recorded and documented two-dimensionally. In case of foot adjustments and posture corrections, the effects on the leg axes can be immediately examined and simulated on the basis of a compensation analysis. Static and dynamic foot pressure distribution measurement, also known as pedography, is used to determine leg length differences and foot malpositions. 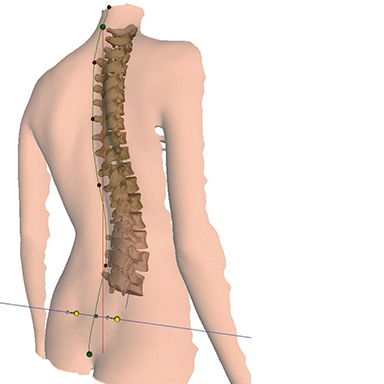 In addition to determining the actual force distribution on the soles, the supply to the spine, pelvis and posture is also calculated and analyzed. With computer-aided measuring technology, the pressure distribution on the feet can be determined and displayed in both static and movement phases of the body. The foot scan analysis is developed from the data of the three-dimensional representation. This ensures optimal results in the customization of insoles, since the examination goes beyond the normal footprint. Along with pedography, a podoscope can be used to conduct subsequent measurements. This tool enables taking images under visual inspection on the basis of digital measuring functions. Via podoscope images, a static foot inspection while standing visualizes the realistic pressure distribution in the patient’s regular posture, showing asymmetries in foot weight application, foot malpositions and foot corrections. The information gained from the podoscope data can be used supplementary to the static and dynamic foot pressure distribution measurement. 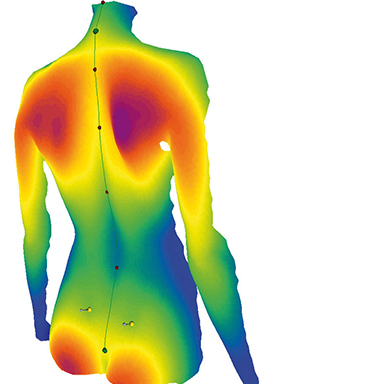 Therapeutic success is objectively assessable by repeating the 4D posture measurement. We can consult the images of individual measurements for comparing the before and after so that direct changes become visible in the contrast. All three of our measuring techniques medically complement each other. This is why we offer them as a comprehensive package only.